Today, BlackArts Racing took its second win of the weekend to give the Zhuhai-based race team an astounding 10 of 11 wins for the 2017 China F4 Championship. 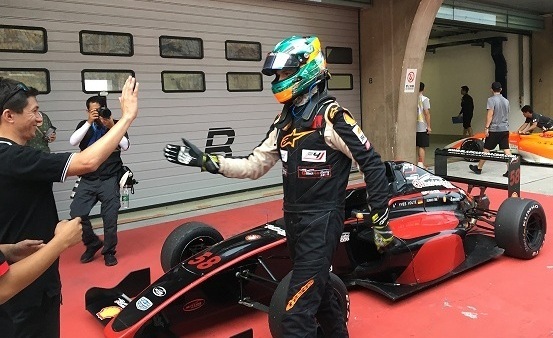 After securing pole position on Friday via Chinese F4 pilot Daniel Cao, BAR's China F4 points-leading driver Charles Leong took both the win on Friday and the win on Saturday, with BAR's Yves Volte joining him on the podium. With the next round to be held again at Shanghai International F1 Circuit on September 15-17, 2017, BlackArts Racing is looking to secure the driver and team championships before the season end, with the final two race weekends to be held at the high speed, technically challenging new circuit at Ningbo, south of Shanghai, on October 14-15 and 28-29. Leong now leads the series by 94 points, with six rounds remaining. Despite BAR's astonishing success in China F4 this season, and its likely upcoming championship win in the 2017 Asia Formula Renault Championship, Leong will still need to shine in the final six rounds in order to wrap up the 2017 China F4 series. Please visit BlackArts Racing at http://www.blackartsracing.com or on facebook at http://www.facebook.com/BlackArtsRacingBAR for team updates.